Having had this book recommended to me from a list of the 100 best comedic novels in the English language, I was somewhat disappointed that the amusement provided herein was of the limited, bring-the-edges-of-one’s-mouth-upwards type, rather than laughs that burrow up from the diaphragm. Nancy Mitford’s novels, which are connected via the narrator and which has characters reappear from one novel in the other, are about English society between the wars and focus on the foibility of the landed gentry (while mentioned in passing, the poor are simply here to be servants, as the focus on the books remains on those with at least 800 pounds per year). It contrasts the Aconleigh household, with its country squire, his all-too-forgiving wife and their passel of children, to that of both the financial classes (in The Pursuit of Love, one of the children chooses to marry a banker’s son) and that of the ultra-rich (the Montdores, in Love in a Cold Climate, where the daughter chooses someone equally inappropriate as a life-partner). The narrator, Fanny, is set apart from both families, as her mother is reviled as the “Bolter,” a woman who flits from partner to partner, and left her daughter to be raised by her sister and relations. 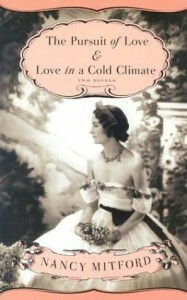 The humor comes as much from the situations that these girls get into in their pursuit of love as it does from Mitford’s writing, which sometimes hides a sharp criticism for both the frivolous nature of these girls who have nothing whatsoever to do with their selves other than society as well as those for whom politics or money is the only thing to live for. If anything, Mitford’s compassion translates across all the characters, and it is this that makes the novels something more than full of spite for its subjects. Reading this 50 years removed, the life and times of these families seems as alien to me as any science fiction novel, so my interest didn’t wane, although I was never captivated by the books.